The marketing and advertising industry has faced radical changes in terms of both increased opportunities and threats as a result of the Internet. Millennials are the first generation to experience this transition first hand. Marketers are eagerly trying to figure out how to transform their marketing efforts effectively online and on which platforms and mediums they should establish a presence and configure digital marketing strategies accordingly. Millennials (aged 18-34) are a unique demographic segment. Due to a combination of the group’s massive size (outnumbering both generation X and Baby Boomers) and a purchasing power estimated at about $170 billion p/a they are perceived as one of the most valuable segments of the population. Companies that are able to connect, keep up with and establish mutually beneficial relationships with this generation will be able to maintain their loyalty as they age and become more prosperous. Millennials are the most ethnically diverse generation yet. They aspire to live in urban environments as opposed to white-picket fence houses in the suburbs. They grew up in a tough economic climate, are highly educated, and are equipped with all the latest technology hardware. Due to their small paychecks, they appreciate a company this will give them some bang for their buck. Brands that are deal/discount focused in relation to millennials are likely to get their business. Millennials are inherently technologically adept, constantly connected via their mobile phones and social media; the majority sleeps with their phone and tweets from the bathroom. They want to be communicated to in an authentic, individual manner and demand to be respected for their creativity and diversity. They support local goods and services, and from the goods they purchase to their interaction with companies, they put a premium on authenticity, scarcity and distinctiveness. They do not want to be stereotyped, their interests and priorities are eclectic and fragmented despite being better connected. Advertisers should engage in a two-way personalized conversation with them on social media. Despite rumors, millennials still spend the majority of their social media minutes on Facebook. If brands are able to communicate to them using celebrity endorsements, event-sponsorships, social/community causes and/or discounts millennials will not only function as recipients of information, but provide input and become brand ambassadors. Millennials care about social issues and all though they are not financially stable enough to write checks to charities, philanthropy is important to them and they enjoy crowd-sourcing their philanthropy. They are more likely to spend more on products from companies that invest in social betterment. My current findings show that certain areas must be addressed to better equip companies in what is expected to be an increasingly and exponentially shifting industry. Radical new opportunities and threats are expected to prevail in the course of the next 10-15 years. Industry experts suggest that we have yet to imagine what the world will look like. As a result of these anticipated changes, the most fundamental concern is for a company to push their efforts to be open and improve their adaptability to the on-going change. The empowered consumer of today will only respond to a company that meets them where they are, whether that is on a smartphone, tablet, laptop, television or piece of wearable technology. Research shows that television, billboards and print ads are still effective and perceived positively. However, with the most recent demographic trends taken into consideration it is likely that these mediums will have less footing in the coming years. Not only are these mediums less accurate in measurement and targeting, but their use and popularity are decreasing among the younger Millennials who have grown accustomed to controlling when, how and where they consume media. It is vital to start thinking about the ultimate transition from traditional to modern marketing by implementing strategies that build brand awareness and image through online advertising as opposed to the current traditional call-to-action ads companies use in their online advertising today. Creating cross-platform and multi-channel campaigns is proved as the most effective. It is important that websites and content are interchangeable to a multitude of platforms and that the brand establishes a consistent presence and strategy on the social media networks most popular among their target markets. Millennials like to be engaged and want to feel important and listened to. They want the opportunity to interact and brands that are able to encourage consumer generated content are more likely to achieve the highly appealing viral-effect during a campaign. Simplicity is key and the call-to-action should be seamless. The new opportunities to engage millennials give marketers the ability to flexibly adjust their budgets for paid, earned and owned media. A popular and engaging campaign increases the likelihood for earned media and enhanced consumer impressions. It is, however, important to always invest a certain amount in paid media and advertising. Facebook has stopped showing brands that do not advertise through their services in “fans” news feeds. Companies that invest in Google adwords drastically increase their likelihood of being discovered. These services allow you to manually decide budgets on a daily or monthly basis and the platforms will automatically generate the most effective advertising strategies. The same methodology applies to advertising on most other social networks. Choosing which one to invest in has to be carefully considered when looking at your consumer target and the platforms’ demographic. The traditional and intrusive banner-ads are no longer considered effective advertising. Aside from sponsored content, there are now a variety of different formats in which a company can improve their online presence. This includes lightbox ads, silent auto-playing video ads, youtube TrueView ads and interactive ads. Technological advancements will continue to flourish, and there is no doubt that these will affect our marketing departments. Companies already need to prepare to step into a world of wearable technology like Google Glass and Smart Watches, and embrace the opportunities and minimize the threats that the development of 3D-printing may involve. The keyword here is to internally prepare financially and strategically for ongoing change. It is impossible to determine the next ten years, just like it was impossible to imagine our current industry in the 90s. Advertising on Google is very efficient. Investing in youtube ads, mobile ads, AdWords and SEO can make or break a new company. Easily accessible information, phone numbers, store locations, websites are fundamental within this spectrum. Creating a Google + profile will automatically provide searchers with any businesses information directly in the search results. iBeacon is a new technology that will be implemented in the iPhone which will allow retailers to detect a consumer's location and send push notifications with promotions and information when they are located in close proximity. Technologies like these are likely to advance and may reap success if enabled early on. However, it is important for a brand to think quality over quantity when they advertise to Millennials. They are provoked by intrusive advertisements and are more likely to support brands that provide them with information that is complementary to their current task. Content marketing is also a new form of advertising that is beneficial to pursue if the budget allows it. Millennials are more likely to invest in brands that provide them with useful information or engaging/excellent entertainment. It is no longer about advertising to them, but with them. Brands that are rated highly popular among millennials, such as Google and Coca-Cola have created many different channels and content sites in which their brand name is a sponsor or curator. Their goal is to provide free and useful information/entertainment for the consumer’s pleasure. The fact that the consumers are subliminally exposed to the brands logo helps build respect and familiarity with the brand. The information overload that the Internet supports is a concern to advertisers who notice that their marketing efforts are increasingly ignored or filtered out. These filtering mechanisms will continue to grow. Therefore it is important that advertisements are creative, targeted, customer-oriented, engaging, welcoming and entertaining. Millennials are more likely to respond to funny, innovative or cause- oriented advertising. Privacy concerns are a growing issue, and the growing popularity of apps like snapchat and whisper are evidence of this trend. However, research shows that consumers are more likely to give companies access to their information if the following marketing is seen as non-intrusive and relevant to their interests- all the while being secured that their information remains safe within the company. Millennials value mutual trust and transparency. It is important that brands stay true to their promises and don’t challenge their consumers trust. If this is the case, negative information can be spread virally and within seconds online. Thus, utilizing sufficient social monitoring and measurement tools within the company can help marketers stay alert about what is being said about a company. Any company should invest in personnel that understands these technologies and are able to make sense of the data. Millennials familiarity and upbringing with technology has allowed them to appreciate and effortlessly adapt to the accelerating level of innovation in our world. For a brand to remain relevant and tap into the millennial consumer market, enabling the same mindset is vital. Change now and don’t stretch it over five years; because the industry will likely have changed again. 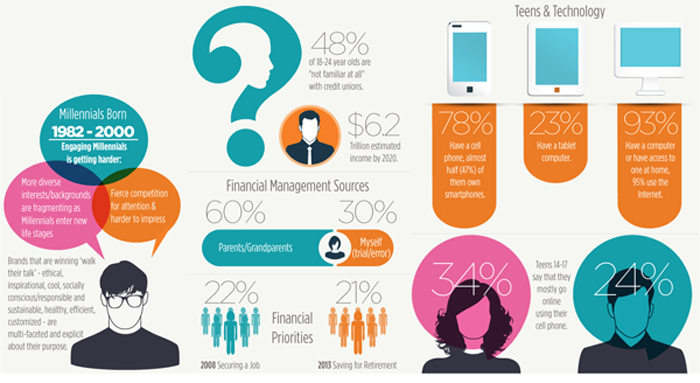 65% of millennials own smartphones with data plans. According to eMarketer it is estimated that U.S. mobile ad spending this year will surge 75% to nearly $8 billion. For the time being, our priorities should be on adapting a strong mobile strategy, as this is the area in which we see the largest growth and opportunity in the coming years.